300 pages | 30 B/W Illus. Art for Children Experiencing Psychological Trauma aims to increase understanding of art’s potential to enhance learning for children living in crisis. 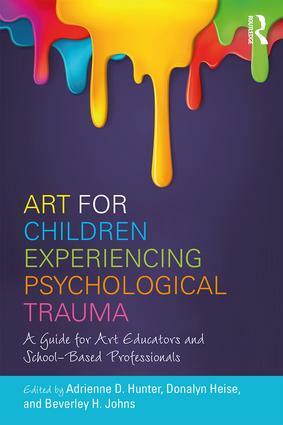 In this ground-breaking resource, the first of its kind to focus specifically on the connection between art education and psychological trauma in youth populations, readers can find resources and practical strategies for both teachers and other school-based professionals. Also included are successful models of art education for diverse populations, with specific attention to youth who face emotional, mental, behavioral, and physical challenges, as well a framework for meaningful visual arts education for at-risk/in-crisis populations. "Marking art is a powerful and effective strategy for working with children experiencing trauma. Art for Children Experiencing Psychological Trauma: A Guide for Art Educators and School-Based Professionals, impressive in the breadth of topics covered by experienced professionals, is the desk reference for educators in the field and an authoritative text for students preparing to work with children in school- and community-based settings." "Art educators have been waiting for this book! Hunter, Heise, and Johns focus their extensive experience on the growing numbers of in-crisis students in classrooms and community programs. Trauma can leave a range of emotional, physical, and learning problems. Their comprehensive book includes guidelines for recognizing children in trauma, behavioral strategies, and art lessons. They demonstrate art classrooms’ healing potential to be a safe and supportive environment where students can find acceptance and positive recognition." Adrienne D. Hunter, MEd, has over 35 years of experience teaching art to at-risk, in-crisis, and/or incarcerated youth. She is a national presenter, a past president of the interest group on Special Needs in Art Education (SNAE) within the National Art Education Association, and a past membership co-chair for the Council for Exceptional Children’s Division of Visual and Performing Arts Education (DARTS). Donalyn Heise, EdD, is founder and co-director of Teacher Effectiveness for Art Learning (TEAL), and is a leader at the local, state, and national level. She is a researcher, author, national presenter, and award-winning educator with more than 30 years of experience teaching art to youth who have experienced psychological trauma. Beverley H. Johns, MS, is a professional fellow at MacMurray College. She has worked in public schools with students with significant behavioral problems for more than 33 years, presented international workshops, and authored more than 20 special education books.